Welcome to Spirit Plus Nutrition. 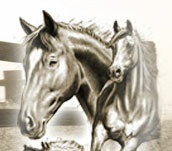 We hope you enjoy your visit and find that the following information on Natural Horse Nutrition can help you fulfill your natural horse care goals. "Natural-Based Nutrition" - is the key component to all products of Spirit Plus Nutrition, a division of Spirit Plus, LLC. Unless horses are fed properly, their maximum potential can not be realized in these areas: Reproduction, Growth, Body Form, Speed, Endurance, Style, and Attractiveness. It is our belief that the foundational ingredient to both a happy horse, and a happy horse owner is: Optimum Health Through Balanced Nutrition. Prevention is always the best cure! 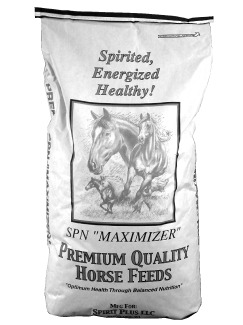 We provide natural nutritional products for horses with our complete line of SPN Maximizer Horse Feeds, and Supplements. Our mission statement is "To achieve optimum health through premium-quality, natural- based nutrition. Our purpose is "To provide you with natural-based, quality products delivered to your door, at a fair price". "My horse, Murphy, is an appendix QH and lives in WI. He lives outdoors all year long, never in a stall. Every winter, he’s had trouble keeping weight on, and then in the spring, he has trouble shedding out. Since I board him, I don’t have as much control over his living situation as I would like. So this winter, I decided to blanket him after he had grown a decent winter coat, and I consulted Ron from Spirit Plus about his weight issues. Ron suggested some of the food-grade ground flax seed, the SPN Digestion Max. 25 Pellet, and I also opted for N.O.M.S. = for nutritional support against parasites. This winter, he’s done great! He gained about 75 pounds after I put him on Ron’s suggested supplements, and fleshed out to a healthier normal weight. His spirit, energy and temperament also improved, and he has a wonderful gloss and shine to his coat. He is also shedding out normally this year, the first time ever. This gives me so much peace of mind knowing that what he needs nutritionally, is what he’s getting. Thanks Ron for helping my horse finally get the nutrition that he needs, and making it easy and affordable to do so!"